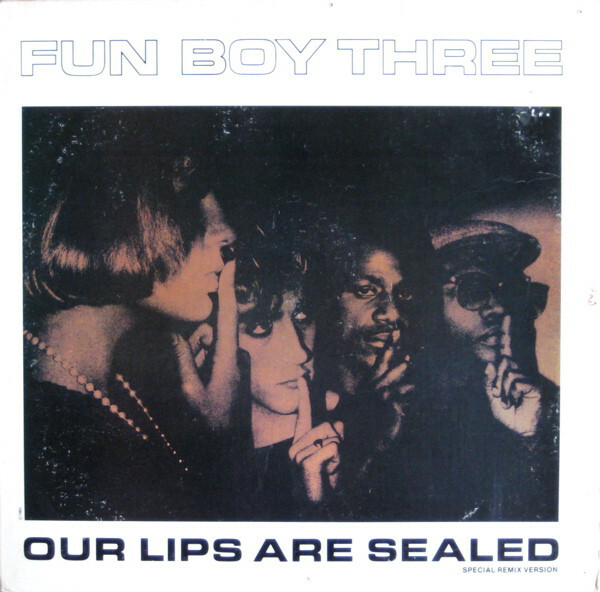 I recently bought a copy of the US 12″ single of the Fun Boy Three version of “Our Lips Are Sealed,” so now I could finally hear something more than memories for the first time in 35 years. I had never owned the song and it had been that song since I had seen the scant few showings of the music video for it on MTV. Of course, it was now time for another entry into the Steel Cage Match thread on this blog! The first Go-Gos song that most people heard by the band was their first single after being signed to I.R.S. Records in 1981. Older fans may have heard the 1980 Stiff Records single of “We’ve Got The Beat,” but that was a UK import single. When I.R.S. released “Our Lips Are Sealed,” that song came out in June of 1981, taking all summer to creep into the US top 20 by the fall. The Go-Gos were… going places. The light, upbeat pop of the song made it a natural radio hit that actually fulfilled its destiny. How many times did it sound like a hit to me only to languish in obscurity? The song led with the beat from drummer Gina Schock. Back then, Belinda Carlisle was not squeezing excessive vibrato into her singing, so her performance was breezy with Jane Weidlin’s lead on the middle eight being winsome and girlish. Charlotte Caffey added the synths with thin string washes to balance out her tremoloed guitar leads. It’s 2:45 of fresh-faced pop fun in spite of the song carrying its emotional heft from the very real backstage affair that tourmates Jane Weidlin and Terry Hall of The Specials experienced then they toured the US together in 1980. Thought the lyrics were undoubtedly drawn from their reality, the song was still a light piece of fluff in terms of arrangement and performance. Producer Richard Gottherer was hired to make ear candy that went down smoothly. That was not necessarily so when Terry Hall returned the volley for the second [and final] Fun Boy Three album in 1983. First of all the song was produced by David Bryne, where it stood as the acme of his external production career, in my opinion. While the song still led with the drums, the arrangement and production was richly textured and warm; featuring layered conga percussion from Blue Rondo Ala Turk’s Geraldo D’Arbilly that formed a wall of sound with the drums that had the deep, chanted backing vocals forming a dense patina on top of them. Then the song’s had Nicky Holland’s arrangement, which had as it’s ace-in-the-hole Caroline Lavelle’s cello having the spotlight in the instrumental bed. It sounded fantastic. A rich cocktail of dark-hued chamber pop with the cherry on top being the wonderful vocals from Terry Hall and June Miles-Kingston. Their harmonies were less strident than on the Go-Gos version. Hall, in particular sang with a clear, almost androgynous tone that made for a nuanced take on the material. The defiant hurt embodied in the lyric manifested more acutely in his performance. At the end of the day there’s no contest as to which performance I prefer. 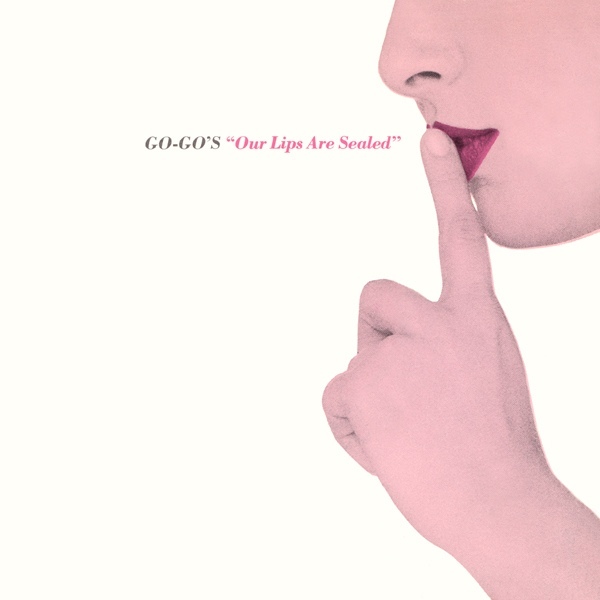 In comparison, the Go-Gos version was like a neon colored comic book. The mystery was why did I wait 35 years to have this in the Record Cell??! This entry was posted in Steel Cage Match and tagged 1981, 1983. Bookmark the permalink. I still have my double 7″ copy of that FB3 single.its a classic. A band I was briefly in during the mid-90s did an electronic version and I mimed synths to it for a memorable PA in Soho,London,after Pete Burns came backstage to wish us well in Cleopatra wig and ankle length fur coat. I never really got into either the Go-Gos or FB3,but this is a great piece of work. Gavin – As ever, your adventures are amazing. I can only imagine Pete Burns bestowing upon me gestures of good fellowship. You can conjure actual memories! I have been curiously resistant to the many charms of Terry Hall with scant amounts of his work in every capacity shamefully represented in the Record Cell. I think I recall seeing the 2×45 in the import 7″ bins back when there were such things still in the world. Sigh! Still digesting the comment about Terry Hall trysting with Jane Weidlin. That affair between those two has been the stuff of legend for years. One of my favorite new wave pairings (Suggs and Bette Bright being another). I understand the FB3 version may have the emotional heft, but it just didnt work for me. (I much prefer their collaborations with bananarama). I NEVER tire of hearing the GoGos version…just brilliant. The whole thing just fires on all cylinders from beginning to end. I like ’em both. Nothing wrong with a good song done a couple different ways. Ok, I seriously knew nothing about this Suggs thing. I gotta hang up today before there’s any other revelations, like Sarah Cracknell running off with some French guy or something weird like that. bpdp3 – I have liked the Go-Gos version for 37 years but there’s still no contest as to which I’d take to a desert island. FB3 was operating on a whole other level. I was just thinking of Nicky Holland today as I listened to Trees and Flowers from Strawberry Switchblade. Holland’s work was all over that one. I’m with Tim… love both versions. If I have to pick one, I go FB3. I’m a huge fan of Terry Hall and all of his stops along the way. If you don’t have his ’94 solo album, Home, go get that sucker. The first five songs are perfection. Brian – I need to commit to a program of Terry Hall remediation! As for Ms. Holland, her “Sense + Sensuality” has been in my want list of late. Ugh, what a choice to make! Love them both, but for me the Go-Gos version edges ahead. I honestly think the prettiness and bounce the Go-Gos bring slightly trumps the dour vibe of the FB3. But in the end no matter who goes out on top, we all win. Taffy – And we need to all win now more than ever! 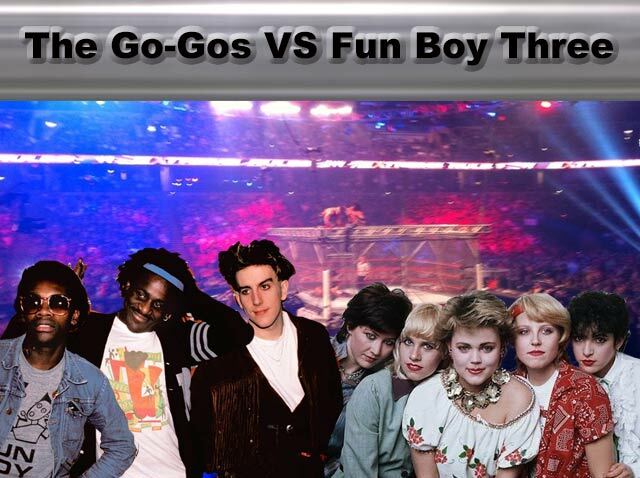 In this corner Neil Tennant…..in the other corner Chris Lowe…..it’s the rumble in the jungle, the carnage in the kennel. Pet vs. Pet will the shop ever be the same? I Want A Dog – Rent B-Side, kooky, fun, clunky, chunky and, best of all, woofing b-side. I Want A Dog – Introspective version. A song that made me briefly consider house music. Always on My Mind – 1987 Christmas King of the Charts version? Stomping disco gallop of a number that telegraphed quite clearly that these late comers to the 80’s music scene were a force to be reckoned with. This could be appended with Pet Shop Boys “I’m Not Scared” vs. Patsy Kensit & Eighth Wonder, “I’m Not Scared” (I’ll take the French mix, thanks). No brainer slam dunk for the PSB on that one. Tim – I only heard the original years later on a cripplingly expen$ive 8xCD package I bought from Razormaid. No argument there! And yet, Jim Kerr married that woman! Actually, neither of his wives make sense to me. Welllllllll…at least Patsy Kensit is easy to look at. I never got the whole thing with Rosanna Arquette going through one of the guys from Toto, Paul Buchanan and Peter Gabriel. Tim – AAAAAGH! My personal greatest fear! Roseanne Arquette linking up with ANY musician I liked. I can’t speak for Toto, but in the cases of Gabriel and Buchanan (how in the HOLY HELL did the latter happen?) her trysting coincided with a massive drop in the artist’s quality. At least Buchanan recovered. Shame about Gabriel! The Mid-Air album left me on the ground. Maybe I should try it again. I did really like that Quiet City one off that he did, my cd isn’t the best, everything sounds thin and dim….I don’t often say someone please remaster this cd but this is one that sorely needs a loving touch. And of course no one has heard of it so the odds of it happening are slim. Tim – “Mid Air” was one of my faves for 2012. But Quiet City…? I’ve never heard of it until now! Treasure that CD, buckaroo, because I sure can’t afford the copy on Discogs right now for a cool €200.00! He does vocals on a few tracks. It’s a hard one to describe, kinda Blue Nile-ish but not. Due North is the standout track. I pick FB3, but maybe because I really like the “Waiting” album and I don’t own anything by Go-Gos. As for Jane Wiedlin…my biggest “New Wave” crush for sure. zoo – I always felt that the character of Hopey in the Love + Rockets comic was based on Jane Weidlin. Haha, you could be right!